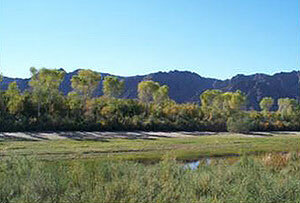 GSA completed an assessment of the potential for riparian restoration projects throughout a 200,000-acre segment of the historic Gila River floodplain, upriver of Yuma, Arizona. We reviewed all restoration projects in the area to determine lessons learned and identify challenges and opportunities for restoration success. Primary limiting factors identified were groundwater depth, groundwater and soil salinity, and prevalence of wildfires. 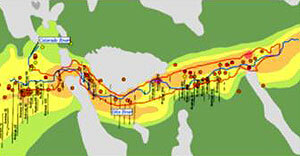 Ecologically-relevant GIS data available for study area were compiled, including existing vegetation and open water, soil texture and salinity, groundwater salinity, fire frequency and size, adjacent land use, and site access, were used to construct a Multiple Accounts Analysis and rank river reaches for restoration feasibility. 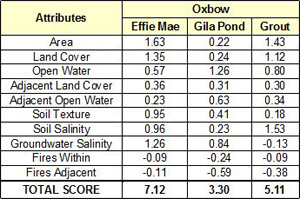 Specific areas of interest, such as historic restoration sites, remnant native vegetation, and historic oxbows were then assessed and ranked based on GIS data layers. A list of sites was recommended for on-the-ground assessment.